For the first time in a while, we have a first-person shooter video game out that brings the best graphics and killing that is WW1. But in all honesty, it comes nothing to the amount of death, rather, senseless death. Think about how the War started, fate stepped in. A group of plotters including Gavrilo Princip in a conspiracy to assassinate Arch Duke Ferdinand gathered along a parade route in Serbia. The Arch Duke was visiting to see military maneuvers in Sarajevo. They throw a bomb, it explodes and hits the car and bounces off, hits the next car and it explodes and chaos ensues. The assassin takes a cyanide pull and runs and jumps in the river. The pill fails to kill the bomb thrower and the river is 6′ deep and the authorities capture him. 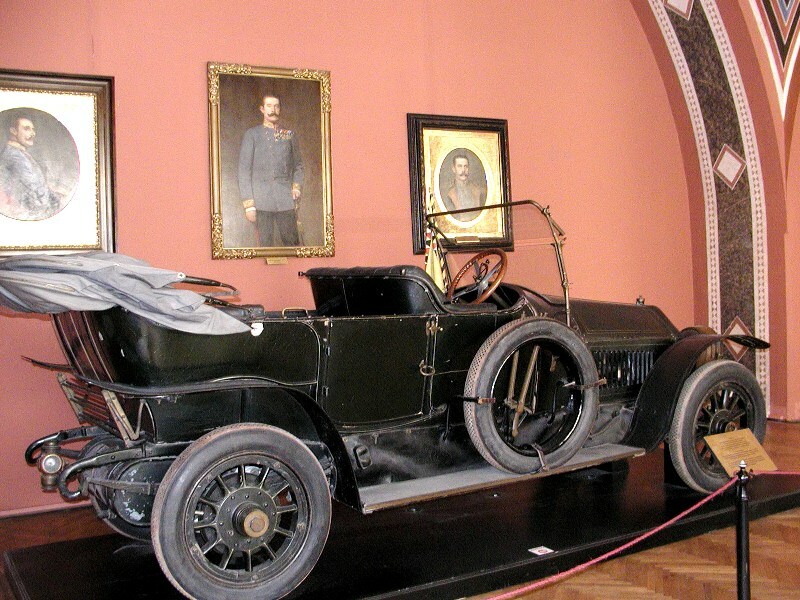 So Gavrilo Princip, despondent that the plot had failed goes to a cafe. He may also have hoped that the car came back that direction, but mostly he was sulking about missing the opportunity. The motorcade took off to the town hall to lodge a complaint. Then the Arch Duke and his wife decide they want to go to the hospital to visit the wounded. The driver takes a wrong turn down a street, realizes it, stops, and begins to turn the car around. Gavrilo Princip, walks out of the cafe downtrodden and looks up and sees the very man he’d plan to assassinate is not more than 5 feet away – shakes off the astonishment, pulls out his gun and shoots the Arch Duke and his wife right there. 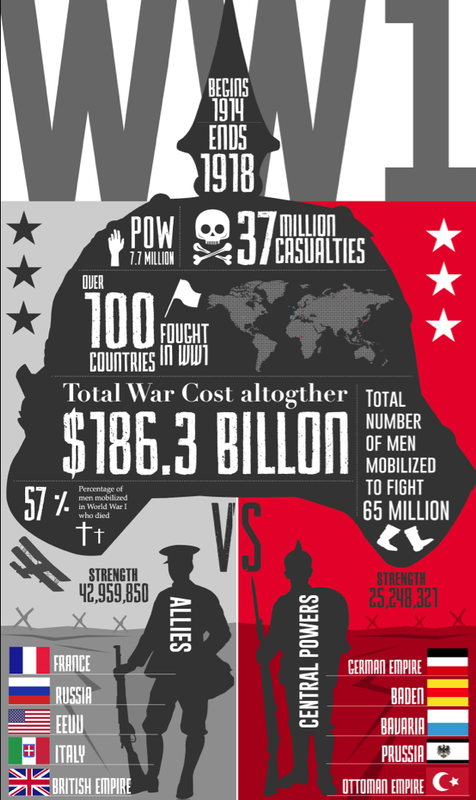 Boom, WW1 beings. 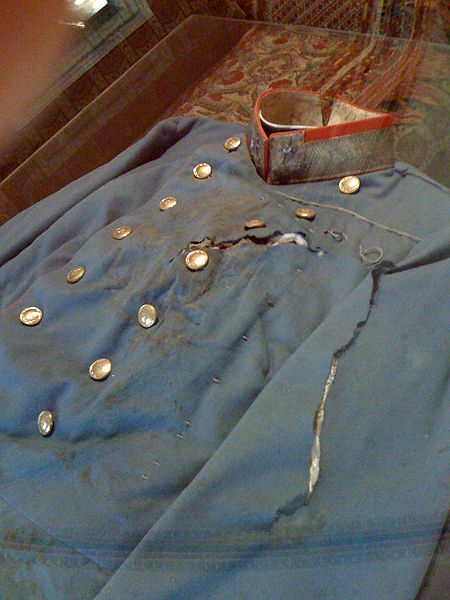 Bloodied shirt 100 years later of Arch Duke Franz Ferdinand. Brain explodes right? The fate that this event had to happen put the Arch Duke right in front of the very person a 2nd time. The last larger European War was in reality, the Napoleonic Wars. 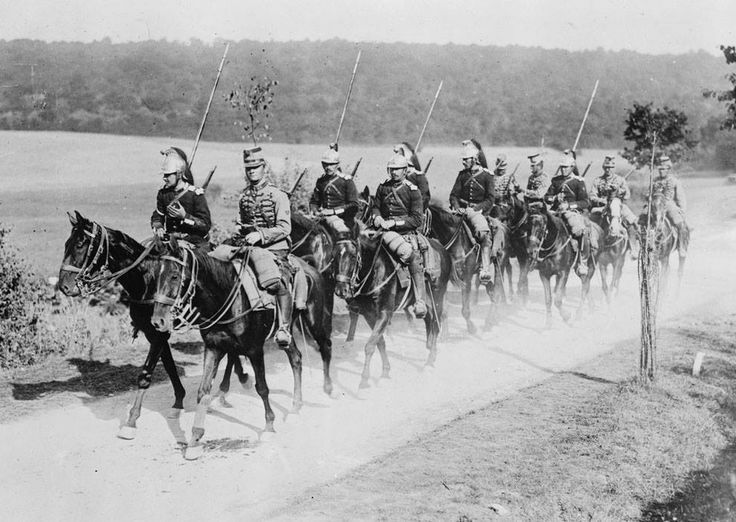 You can see this in the older pictures at the start of WW1 in 1914 with flashy uniforms, horses, and full cavalry charges. 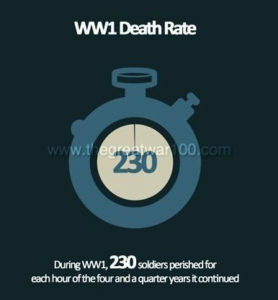 The world had yet to see how effective the new machines of war can impact and change the way war is fought. How soon those cavalry charges are snuffed out with the technological advances of the machine gun. The old tactics of horse cavalry charging and army with inaccurate rifles and the psychological impact that it used to have is gone in a matter of seconds with a hail of tens of thousands of bullets. 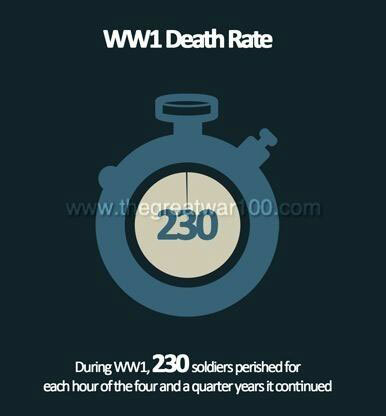 How much the killing power that machines have afforded man on the battlefield. Mechanization. 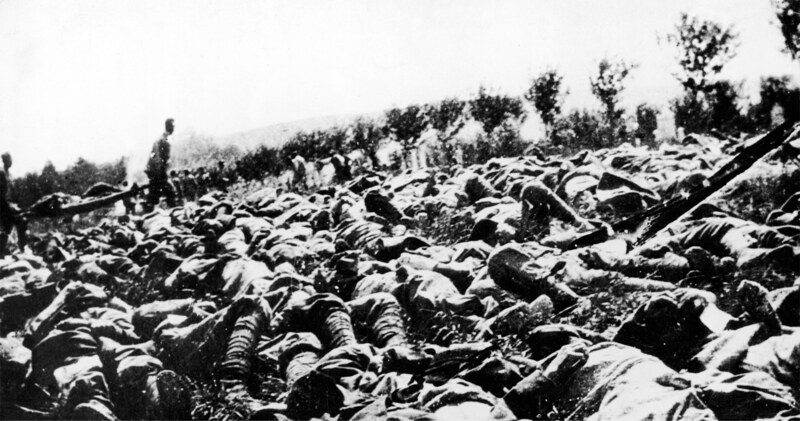 The militaries were not prepared, they started the war the same way they left off the last major war, and thus WW1 turned into a meat-grinder of human beings. ‘How long it takes to absorb the lessons that are being taught in the conflict.’ Is really the key theme. 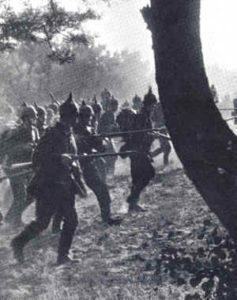 The bayonet charge, and the culture of the offensive. The militaries are organized like Napoleonic times – they don’t want to hear that is the wrong way to be organized. The gun crew had to go 300 yards away (3 football fields). The crew had to lay cement, wait for it to dry, then assemble the gun. Then when they want to fire it – the gun crew goes 300 yards away and fire it electronically, had to put cotton wadding over their eyes, nose, ears, and fire it with their mouths open on they blow out their ear drums. The shell is fired in a 4000′ arc it takes a full minute to get from the gun to the target. The shells hit the top of a fort, pierces the concrete and armor, then it explodes. Welcome to 20th-century warfare. 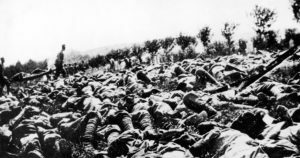 Think about that, one battle had more casualties than the bloodiest war in American History the Civil war with a mere 600,000 casualties.